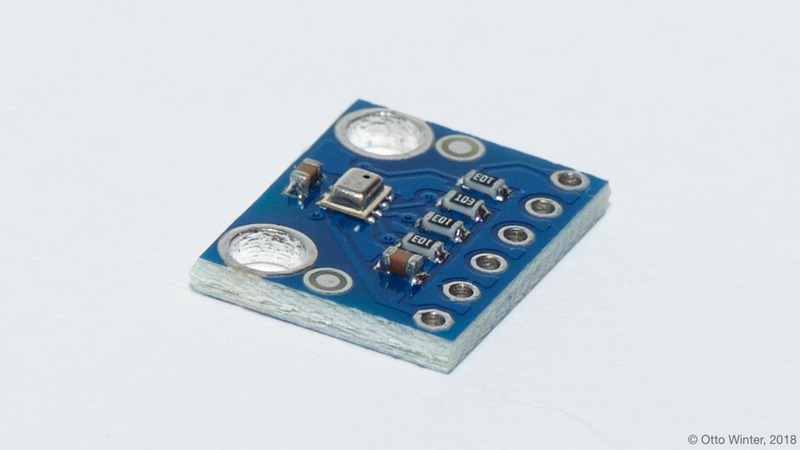 The bmp280 sensor platform allows you to use your BMP280 (datasheet, Adafruit) temperature and pressure sensors with ESPHome. The I²C is required to be set up in your configuration for this sensor to work. BMP280 Temperature and Pressure Sensor. name (Required, string): The name for the temperature sensor. oversampling (Optional): The oversampling parameter for the temperature sensor. See Oversampling Options. id (Optional, ID): Set the ID of this sensor for use in lambdas. All other options from Sensor. pressure (Required): The information for the pressure sensor. name (Required, string): The name for the pressure sensor. address (Optional, int): Manually specify the i^2c address of the sensor. Defaults to 0x77. Another address can be 0x76. iir_filter (Optional): Set up an Infinite Impulse Response filter to increase accuracy. One of OFF, 2x, 4x, 16x. Defaults to OFF. update_interval (Optional, Time): The interval to check the sensor. Defaults to 60s. Pins on the BMP280. Only VCC, GND, SCL, and SDA need to be connected.